This attack does 30 damage for each Pokémon Tool card attached to Pokémon in play (both yours and your opponent’s). 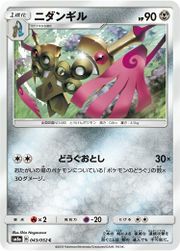 Doublade is another Pokemon coming out of the Team Up expansion set that has quite a bit of upside. It is a Stage 1 Metal Type Pokemon that has 90 HP, but the Aegislash it evolves into has 140 HP and the ability to reduce attacks upon it by 40 damage. Attach a Frying Pan, and you need to do 210 damage to OHKO a single prize Pokemon. And Tools are the key for this deck. Doublade’s attack Tool Drop does thirty damage times the number of Tool cards in play BOTH yours and your opponent’s. So it’s safe to say that your opponent probably won’t use any of their Tools when they come up against Doublade, so this card has an inherent soft Tool lock. Decklists usually average about three Tools per sixty cards, so that does make 5% of the cards in your opponent’s deck dead cards. Even if your opponent doesn’t attach any Tools to their Pokemon, however, you can still get nine or even ten Tools in play with the help of Genesect GX whose ability Double Drive allows you to attach two Tool cards to Genesect. This means that you could do up to 300 damage on any given turn, although I think that top end number is probably unrealistic. Still, the potential is there to hit into the two hundreds with a single attack, and anything that has the potential to do damage that is three digits long with a 2 as the far left digit has to be considered right now. I am using Memory energy and Shining Celebi SM 79 to potentially use Aegislash and take advantage of that massive HP, and I’m not using Choice Band but hoping that my Exp Shares and Wishful Batons will help with continuity of attacks. And I’m full aware that sometimes Aegislash or Genesect GX will have to probably attack at some point, but I believe that Doublade will be the featured attacker of this archetype. But it is nice to have the potential to do a GX attack. So let me know what you think, is there something essential I’m missing from this build? It is extremely tight and I feel that there isn’t much room to fit anything else in, but maybe I’m wrong and missing a really good card that I should find room for. Next Post:Blissey Venusaur… and a Team Up code card giveaway!